Lt. Gen. John Kelly will soon become the new four-star commander at U.S. Southern Command, a post that will require him to oversee the fight against drug trafficking, natural disasters, humanitarian crises and cyber warfare in central and South America. 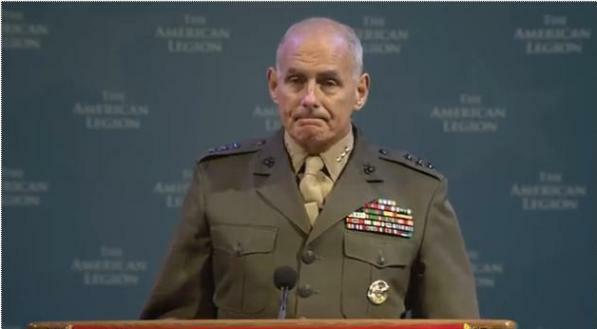 As the Long War Journal points out, Kelly delivered a powerful 30-minute speech on Tuesday to the American Legion National Convention in Indianapolis. He addresses the extremist nature of the threat the U.S. faces from terrorists and how difficult it is for a family to deal with the loss of a loved one in a war zone — something he knows all to well after his son, 1st Lt. Robert Kelly, was killed in Afghanistan’s Sangin district in 2010. WE’RE VERY PROUD OF OUR GRANDSON WHO WS THE 1% OF THE YOUNG WHO JOINED THE MILITARY . WE ARE JUST AS PROUD THAT HE SERVED UNDER GENERAL KELLY’ AND GENERAL KELLY’S SON. WE HOPE HE WILL BE AN EXAMPLE FOR OTHER YOUNG PEOPLE TO UPHOLD THE PRICIPLES OF OUR NATION. On 6 Mar 2008, Lt. Gen. John Kelly escorted Gold Star father John Wroblewski and I to the site of the 6 Apr 2004 ambush in Ramadi, Iraq which claimed the life of 2Lt. J.T. “Ski” Wroblewski and 11 other men of 2/4 Marines. My military embed mission was simple: perform a memorial service at the ambush site to honor the fallen of 2/4 Marines “Echo” Company. My photographs and USMC Cpl. Angel’s video of this historic 1st and only visit to an actual combat site by a Gold Star parent was aired on Fox News on Memorial Day 2008. Thank you, Lt. Gen John Kelly, and the Marines of PSD Co for making our 2nd visit to Iraq a successful one to honor the fallen heroes of 2/4 Marines.